What’s so fancy about Object Oriented Programming? Computers have been invented to help real-world people solving real-world problems, even though it seems today that computers actually contribute problems to the real world. Since a plain computer doesn’t know anything about the world beyond its steel case, it takes a programmer to describe a model of the real world to the computer. 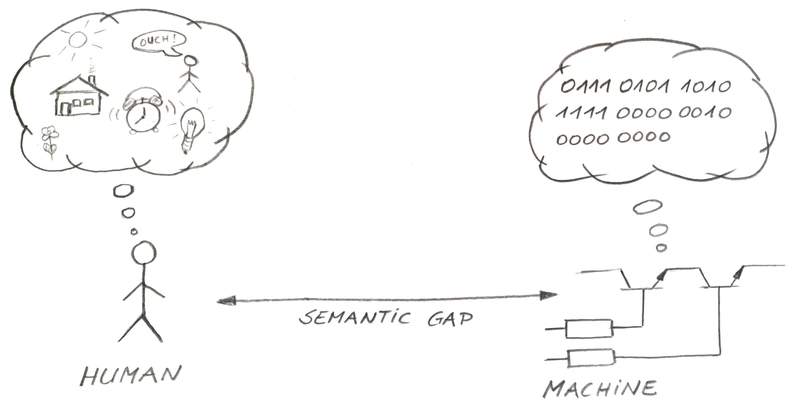 The programmer’s job is to overcome the semantic gap by translating human language into a programming language. Suppose you want to calculate the average speed of a car that travels 100 miles in 2 hours. In this case, the model of the real world only consists of a simple mathematical equation. The model will get more complex, once you begin to consider fuel consumption, headwind, tire abrasion, earth rotation, temperature, theory of relativity, and whatever crazy stuff is going on in this universe. If you want to learn how to write object-oriented programs you first need to get familiar with some terminology. A class is the blueprint that describes what properties an object may have and what it is able to do. The properties of an object are called attributes or fields. “What an object is able to do” is defined in methods. Methods can also be imagined as some kind of “levers” that allow other objects to interact with this object. Let’s have a look at a practical example: We are going to design a class which describes the model of a door that can be opened and closed. Secondly, we need to define how other objects, Hans for example, can interact with the door. Hans shall be able to open and to close the door. The verbs in the sentence will give you an idea of what the methods are: open() and close(). Note that there are always parentheses attached to a method name. Finally, we’ll have a look at the attributes of the class. If you think of properties that our door may have, you’ll probably come up with a huge list. The door has a weight, a height, a width, a color, a material, a specific temperature, the state (open or closed) and so on. Always keep in mind, however, that there is no model without limitations. Hence we will focus on those properties that are essential for the model to function. You can often identify them by asking yourself: “Which of the properties may be influenced by methods of the class?” In this example we need just one attribute, isOpen, which can be true (if the door is open) or false (if the door is closed). A common mistake is to introduce redundant attributes: isOpened and isClosed, in this example. Obviously, a door cannot be open and be closed at the same time. Whenever one of the attributes is modified in a method, the redundant information would have to be updated as well. In larger projects this can result in hardly maintainable source code, a high risk of bugs, and last but not least, waste of runtime resources. UML (Unified Modeling Language) provides a variety of diagrams that allow to describe any detail of entire software projects. Classes are described by UML class diagrams. The following class diagram shows our model of a door. A class diagram consists of three rows. The class name (always bold and centered) is in the first row. The second row contains the attributes, and the third row contains all methods. Both boolean and void are data types. It basically means that isOpen may only have two states, either true or false. void after the methods means that nothing is returned from the method. Don’t worry about this, and don’t worry about the + and the – signs, either. I’m going to explain this in one my next postings on OOP. This entry was posted in Programming Essentials, Uncategorized and tagged java, Object Oriented Programming, OOP. Bookmark the permalink.